Our thyroid plays a huge role in metabolism. Alongside insulin and cortisol, thyroid hormones are a driving factor behind metabolic rate and weight management. As you would expect, many health problems emerge if our thyroid stops working properly. Studies show that at the very least 3.7% of American adults have an underactive thyroid, which is likely similar in other developed countries (1). Rates are on the rise, as are those selling thyroid supplements and giving inaccurate dietary advice. This article provides an unbiased summary, splitting fact from fiction. What is an underactive thyroid (hypothyroidism)? 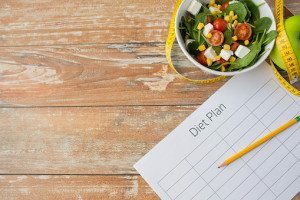 Is there a particular thyroid diet for weight loss? The thyroid is a butterfly shaped gland on the front of your throat. TSH instructs it to produces two different thyroid hormones – thyroxine (T4) and triiodothyronine (T3). These are necessary to send instructions to every single cell in your body. Without these hormones, many metabolic processes break down. An underactive thyroid (hypothyroid in a medical context) refers to when the gland doesn’t produce enough thyroid hormone. Hashimoto’s Thyroiditis (an autoimmune disease) is by far the most common form of hypothyroidism in the Western world. In almost all cases hypothyroidism is the result of inadequate T4 production, rather than inadequate T3. Conventional diagnosis relies on TSH and T4 blood tests, however there’s good reason to believe those tests alone are inadequate. Left untreated, an underactive thyroid will lead to a host of health problems including weight gain, hair loss, fatigue, poor memory and feeling unusually cold. This 3-minute TED-Ed animation is great if you want a bit more detail. Conventional treatment for an underactive thyroid is with the hormone levothyroxine (LT4 or Synthroid). It works by replacing the T4 that is not being naturally produced, and is the most effective treatment for this condition. Summary: The thyroid gland is fundamental to many metabolic processes. An underactive thyroid refers to when it doesn’t produce enough thyroid hormone. Food on its own cannot cure or independently treat a diagnosed case of hypothyroidism. Hormone replacement therapy with prescription medication, such as LT4, is necessary to restore thyroid function. That’s why LT4 is absolutely essential for any health care system. In saying that, if you have underlying nutrient deficiencies or food intolerance that remains untreated, LT4 becomes a bandaid that doesn’t treat the root problem. It’s important to note that if you use LT4, take it before or well outside of meal times. Absorption of the T4 hormone is greatly reduced if consumed alongside food, especially soy, high-fibre foods and coffee (2). Summary: There is no one food or diet that can correct an underactive thyroid on its own. Thyroid hormones must be replaced through medication. Iodine is an essential trace element that all living organisms need. Our thyroid gland requires iodine to produce thyroid hormones. For that reason, a deficiency in iodine can lead to an underactive thyroid. However, a lack of iodine is rarely the cause of hypothyroidism in developed countries where it is abundant in the food supply (3). Nevertheless, including iodine-rich foods in your diet is a good idea to be safe. Navy beans, potatoes, eggs, cow’s milk and iodised salt are great food sources of iodine, although levels often depend on iodine content in the soil. Seafood is also iodine-rich as marine animals can concentrate iodine from seawater. Note that if you have Hashimoto’s thyroiditis (strong majority of all hypothyroidism cases) then speak with your doctor before increasing iodine intake. 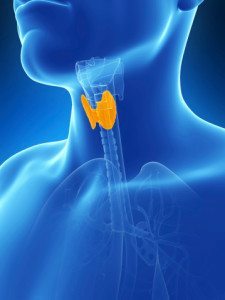 It can be helpful, but in particular circumstances an increase in iodine can actually irritate the thyroid. The World Health Organization (WHO) deems a population iodine deficient if urine concentration levels are less than 100 microgram/L. Americans had a median level of 160 microgram/L in 2003-2004 (4), while Australians were at 124 microgram/L in 2011-2012. Most developed nations are also well above the deficiency level, which is why iodine-related hypothyroidism is so uncommon. To ensure rates remain low, more than 100 countries have adopted mandatory iodization of all food-grade salt or bread. Note this process isn’t mandatory in the US, but more than half of all salt sold there does contain added iodine (5, 6). Therefore, if you eat a healthy diet that contains some iodine-rich foods, it is highly likely you consume sufficient amounts of iodine. 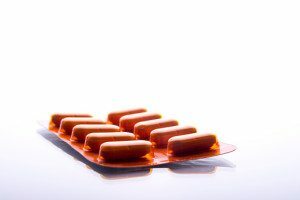 Supplemental iodine is not recommended for the general public, and has actually been shown to cause further thyroid dysfunction in some instances (7). The big exception to this rule is if you are pregnant or breastfeeding. Iodine requirements increase by more than 60% because the developing fetus or infant requires iodine too. Women who fall into this category should definitely be supplementing with iodine, as per the World Health Organisation’s recommendations. You can find a good range of iodine supplements on Amazon (disclosure: this is an affiliate link), but please consult with your doctor before you start taking them. Summary: As iodine is required for thyroid hormone production, ensure your diet contains foods naturally rich in iodine (but if you have Hashimoto’s then check first with your doctor). Unless you are pregnant or breastfeeding, iodine supplements probably won’t be beneficial. There is a theory that low selenium levels contribute to hypothyroidism through different mechanisms related to iodine. But a 2013 Cochrane review of the research concluded evidence is lacking to definitively support or refute the use of selenium supplements (8). So the benefits remain unclear, but the known side-effects of selenium supplementation include digestive issues, hair loss, fatigue, and irritability. It may even greatly increase the risk of prostate cancer in men (9). It’s fair to say the risks outweigh the benefits at this stage. Additionally, those with a low iodine status who supplement selenium may in fact aggravate hypothyroidism. 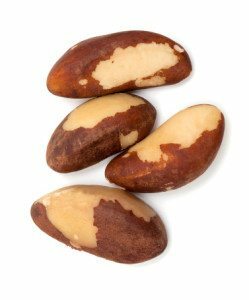 For this reason it’s best to stick with selenium-rich foods like Brazil nuts, mushrooms, meat and fish, which are far less potent than supplements. Summary: Be sure to include selenium-rich foods in your diet, but selenium supplements are unproven to help and linked with several health issues. Goitrogens are naturally occurring substances that can potentially inhibit thyroid production (10). Vegetables from the cruciferae family are known goitrogens. They include brussels sprouts, broccoli, bok choy, cauliflower, cabbage, kale and more. In theory then, eating these vegetables would aggravate an underactive thyroid and should be largely avoided. But this is only the case if you are iodine deficient or you consume ridiculously large quantities. Raw cabbage was very problematic in rats when it made up a whopping 33% of their diet (11). One lady also managed to put herself into a coma by eating 1-1.5 kgs of raw bok choy daily (12). Assuming you don’t eat phenomenal amounts of raw cruciferous vegetables, you are most likely safe. Frequent intake will only aggravate issues if your iodine intake is poor or you have a goiter. Additionally, cooking cruciferous vegetables and other foods containing goitrogens are thought to greatly reduce its potential impact. A small study in 10 subjects showed that 150 g (5 oz) per day of cooked brussels sprouts for four weeks straight had no negative effects on thyroid function (13). As cruciferous vegetables are so nutrient dense, it’s certainly not recommended to cut them out of your diet completely. Rather, ensure you cook them well and that your iodine intake is adequate. 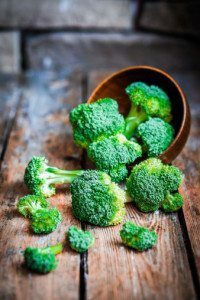 Summary: If you don’t have a goiter or low iodine levels, cruciferous vegetables are safe when cooked well and eaten in regular amounts. The risk only outweighs the benefit if they are consumed in ridiculously large quantities and/or raw. Gluten is a protein found in grain and wheat that is not well-digested by around 6% of people. While it’s fair to say the “gluten-free movement” has gotten out of hand, those with genuine gluten issues are at an increased risk for many health conditions (such as fibromyalgia) if they continue to consume it. And numerous studies have shown a strong link between so-called gluten sensitivity (as well as celiac disease) and hypothyroidism. For those hypersensitive to gluten, it is thought their immune system can confuse components of gluten with thyroid tissue. The immune system then mistakenly attacks and damages the thyroid gland, characteristic of Hashimoto’s thyroiditis. In fact, around 16% of those with celiac disease have antibodies that attack the thyroid (14). Going by this theory, an individual with Hashimoto’s will not improve unless gluten is removed from the diet. Many studies have found that a gluten-free diet reduces the number of antithyroid antibodies, which is favourable for treatment and in preventing new issues (15, 16, 17). However, there are also good studies that found no improvement (14, 18, 19, 20). It would be reaching to say that gluten definitively aggravates an underactive thyroid, but at the same time it could very well play a part. The honest truth is we don’t know. Therefore, if you have an underactive thyroid it’s important to get tested for celiac disease first thing. And if you have a family history of autoimmune disease, or you want to play it extra safe, then eliminate gluten from your diet. Gluten-containing foods do not offer any unique nutrients that you can’t get from other foods sources anyway. If you don’t have symptoms to gluten and don’t feel any different on a gluten-free diet, then it’s likely not a problem. Weigh up the social aspect vs the health aspect and go from there. I’d personally only have gluten-foods as a treat. Summary: There appears to be a link between gluten intolerance (or celiac disease) and hypothyroidism. 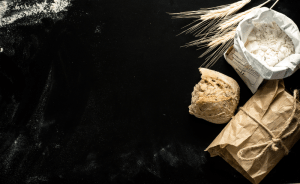 However, the favourable effects of a gluten-free diet are inconsistent at best, so recommendations depend largely on an individual’s medical history and dietary preferences. 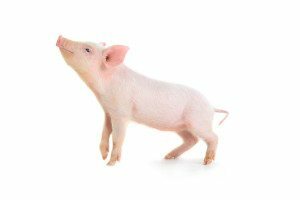 Some alternative health advocates recommend desiccated thyroid (ground up pork thyroid) instead of the conventional LT4 drug because it’s “natural”. Aside from the huge flaws in assuming natural is always better than artificial, the problem is that desiccated thyroid contains a mix of T4 + T3 hormones. Trials using a mix of T4 + T3 have found it is, at best, equally as effective as LT4 treatment (21, 22, 23). Combination treatment is typically used as a backup for those who do not respond favourably or feel unwell with regular LT4 treatment. To be fair, study participants tend to report better tolerance and preference of desiccated thyroid over LT4 (24). Anecdotally, many desiccated thyroid users swear by it. For many it can treat symptoms effectively without the bad side effects of LT4. So desiccated thyroid has its place as an alternate treatment, but it’s certainly not better than conventional. Supplements like desiccated thyroid are also not tightly regulated for dose or quality. Even though they are FDA regulated, supplements aren’t subject to the same strict safety and effectiveness requirements that drugs are. In fact, a study on “thyroid support” supplements found that half of brands contain a low range of T4, while 1 in 10 contained no T4 at all. In other words, taking desiccated thyroid comes with more risk for potentially no extra benefit than standard LT4. You will need to do some trial and error with your doctor to find out what is best for you. Summary: Studies show desiccated thyroid supplements have no benefit over conventional LT4 treatment, and pose more risks. However, anecdotal reports indicate that desiccated thyroid is much better tolerated and can still be an effective form of hormone replacement therapy for some. 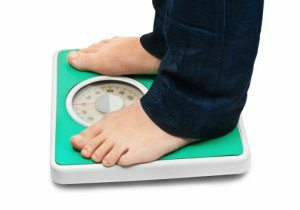 An underactive thyroid can make it extremely difficult to lose weight, especially if your diet is poor. For this reason it’s critical to develop eating habits that are supportive of a healthy weight… not unlike regular weight loss advice (25). The only difference is the thyroid must first be treated with proper medication. Once your hormone levels have been corrected, you can lose weight just like anybody else. That means eating plenty of whole foods that you enjoy, increasing protein intake, cutting down on junk food products, and being more active where possible. To help you get started I’ve created a 6-step guide on how to lose weight with an underactive thyroid, which you can see here. If you’re certain that a consistently healthy diet and regular physical activity have not helped your situation, you may want to consider trialling the Autoimmune Protocol diet (AIP). Summary: There is no particular thyroid diet for weight loss, although I have created a meal plan as a guide. Once thyroid levels have been corrected with medication, you can then lose weight like anybody else. If you want a set diet/meal plan to follow – including the shopping list – then please see my 14-Day Meal Plan for Hypothyroidism and Weight Loss. Foods rich in iodine such as iodised salt, seafood, potatoes, eggs and navy beans. Cruciferous vegetables in reasonable amounts, as long as they are cooked well. A diet high in protein, which helps to curb appetite and keep you feeling full. That includes dairy foods, eggs, legumes and seafood. Any food when you take LT4 medication as this can inhibit absorption. Iodine supplements unless under the guidance of your doctor (especially if you are pregnant/breastfeeding). Selenium supplements unless under the guidance of your doctor. Gluten-containing foods often, if at all. There seems to be a strong link between Hashimoto’s and non-celiac gluten sensitivity. You should always get tested for celiac disease, but this requires you take a gluten challenge. Desiccated thyroid supplements unless synthroid is giving you unpleasant side-effects. Anecdotal reports suggest caffeine intake should be limited to less than 300 mg per day (2-3 regular coffees) as large amounts can aggravate the thyroid. If you want to kick-start your thyroid health, improve energy levels and lose weight, exercise should be part of your routine. It certainly doesn’t have to be strenuous to be effective. 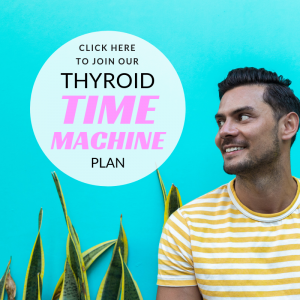 If you want a set exercise plan to follow, specifically for those with an underactive thyroid and low energy levels as it is, check out my Thyroid Time Machine program which will get you into ship-shape. Hypothyroidism can be a serious condition if not managed properly. Presuming you’ve experienced the symptoms and had your TSH tested professionally, you must be prepared to make some dietary changes (recommend doing this under the guidance of a health professional). 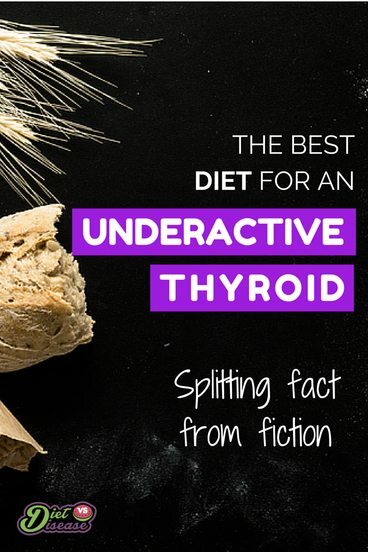 From what current research can tell us, the best diet for an underactive thyroid is one that contains whole foods, is high in protein, and naturally rich in iodine and selenium. That means eating more nuts, vegetables, and seafood, and only using supplements if natural foods are not an option. Most patients report improvement with a thyroid supplement too, but if you consistently eat a healthy and wholesome diet they are unnecessary. If you still want to try one however (under the supervision of your doctor), see this Thyroid Support Supplement (disclosure: this is an affiliate link). It contains both selenium and iodine for thyroid health, as well as vitamin B12 for improved energy levels. Additionally, it is one of the few available that is 100% vegetarian. Cabbage, broccoli and other related vegetables are safe if cooked well (and you don’t have goiter), while gluten is best limited or cut out completely- depending on your tolerance. 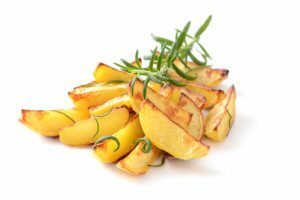 If you’ve been doing all the right things and still feel your situation is not improving, you may want to consider trialing the Autoimmune Protocol diet (AIP). Just keep in mind that what you eat is only one piece of the thyroid puzzle. Complete management of an underactive thyroid includes hormone replacement therapy (Synthroid or desiccated thyroid), regular exercise (cardio and strength), adequate sleep and reducing stress. It’s not easy, but it’s doable. One step at a time. Wish you could go back to how you felt before thyroid symptoms? Introducing my Thyroid “Time Machine” meal plan. Click here to learn more. What Is TSH and What Are Normal TSH Levels? Is Low Carb Bad For Hypothyroidism? 13 Signs of An Underactive Thyroid: Do You Know What To Look For?